Work is busy so progress is slow. Midweek, I pulled the wastegate off and the some of the inlet piping to get a good look at the turbo. Internet searching indicates it is a factory S14 T28. How it made 215 rwkw is a bit of a mystery, but then the whole setup is strange. The turbo has braided oil and water lines, and the factory internal wastegate is sealed up with an external wastegate fitting welded onto the factory cast iron manifold. The wastegate looks to be a cheap eBay item, in the style of a 38mm Tial. Perhaps the turbo is high flowed? I doubt I’ll ever know the answer. The turbo does have a lot of play from front to back, but none from side to side. 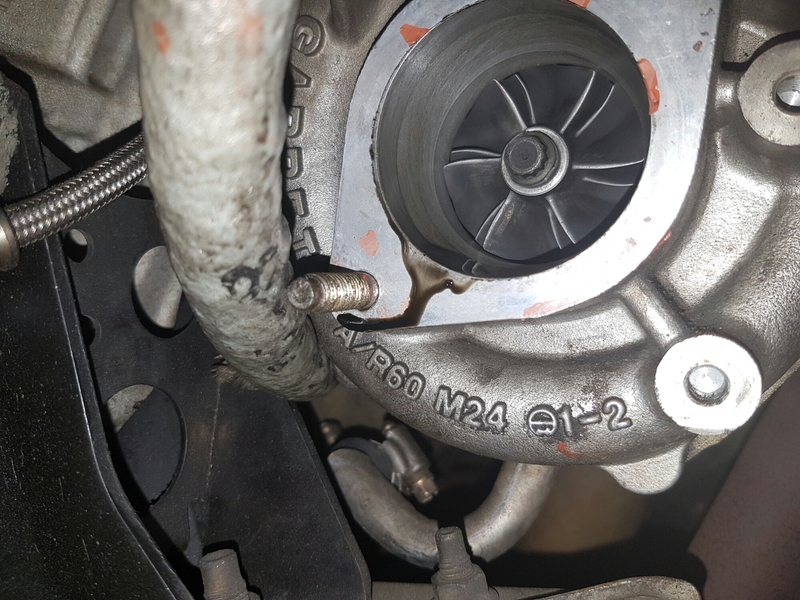 The oil in the compressor inlet concerned me at first but Dave reminded me that the oil breather attaches to the inlet just before the turbo. There is evidence of a small exhaust leak on one of the wastegate flanges. This weekend I’ll get it back together. I don’t have new gaskets, so I’ll use exhaust sealant in the meantime as a bandaid fix. In future, I think I’ll go back to the type of setup I had on the grey 180. This means ditching the external wastegate and changing to a stainless steel equal length runner manifold, with new dump pipe to suit. I have such fond memories of the HKS 2510. I don’t believe they are available new so maybe a HKS GT-SS would provide a similar experience. Another popular choice is the Garrett GT2860RS or ‘disco potato’. It depends on what comes up down the track when I’m shopping. The reason I pulled everything apart was to check for leaks or a faulty wastegate. With VTC enabled the car picked up little improvement in spooling speed. The real conundrum was trying to connect the electronic boost controller that came on the car. Without it, the spring in the wastegate delivers a very stable 15 psi. As soon as I connect it up as the manual suggests, the wastegate fails to open and the engine hits 20 psi before I back off. The solenoid is connected and allows air through like it should. When it is all back together, I’ll connect it using two ports and see if that fixes the problem.